Although C++ is an old programming language, its Standard Library misses a few basic things. Features that Java or .NET had for years were/are not available in STL. With C++17 there’s a nice improvement: for example, we now have the standard filesystem! Traversing a path, even recursively is so simple now! For the last five episodes/articles, I’ve covered most of the language features. Now it’s time for the Standard Library. I’ve planned three posts on that: Filesystem, Parallel STL and Concurrency, Utils. Maybe I was a bit harsh in the introduction. Although the Standard Library lacks some important features, you could always use Boost with its thousands of sub-libraries and do the work. The C++ Committee and the Community decided that the Boost libraries are so important that some of the systems were merged into the Standard. For example smart pointers (although improved with the move semantics in C++11), regular expressions, and much more. The similar story happened with the filesystem. Let’s try to understand what’s inside. 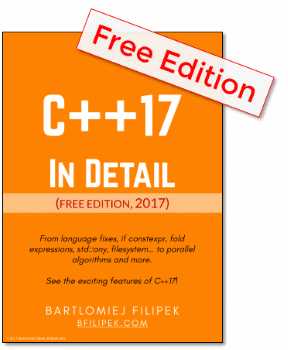 This post is the sixth in the series about C++17 features details. Jason Turner: C++ Weekly channel, where he covered most (or even all!) of C++17 features. OK, let’s return to our main topic: working with paths and directories! I think the Committee made a right choice with this feature. The filesystem library is nothing new, as it’s modeled directly over Boost filesystem, which is available since 2003 (with the version 1.30). There are only a little differences, plus some wording changes. Not to mention, all of this is also based on POSIX. The library is located in the <filesystem> header. It uses namespace std::filesystem. The final paper is P0218R0: Adopt the File System TS for C++17 but there are also others like P0317R1: Directory Entry Caching, PDF: P0430R2–File system library on non-POSIX-like operating systems, P0492R2… All in all, you can find the final spec in the C++17 draft: the “filesystem” section, 30.10. Depending on the version of your compiler you might need to use std::experimental::filesystem namespace. GCC: You have to specify -lstdc++fs when you want filesystem. Implemented in <experimental/filesystem>. Visual Studio: In VS 2017 (2017.2) you still have to use std::experimental namespace, it uses TS implementation. See the reference link and also C++17 Features In Visual Studio 2017 Version 15.3 Preview. All the examples can be found on my Github: github.com/fenbf/articles/cpp17. I’ve used Visual Studio 2017 Update 2. The core part of the library is the path object. Just pass it a string of the path, and then you have access to lots of useful functions. cout << "exists() = " << fs::exists(pathToShow) << "\n"
<< "root_name() = " << pathToShow.root_name() << "\n"
<< "root_path() = " << pathToShow.root_path() << "\n"
<< "relative_path() = " << pathToShow.relative_path() << "\n"
<< "parent_path() = " << pathToShow.parent_path() << "\n"
<< "filename() = " << pathToShow.filename() << "\n"
<< "stem() = " << pathToShow.stem() << "\n"
What’s great about the above code? the path object is implicitly convertible to std::wstring or std::string. So you can just pass a path object into any of the file stream functions. path has begin() and end() (so it’s a kind of a collection!) that allows iterating over every part. What about composing a path? We have two options: using append or operator /=, or operator +=. append - adds a path with a directory separator. concat - only adds the ‘string’ without any separator. Let’s now take a bit more advanced example: how to traverse the directory tree and show its contents? recursive_directory_iterator - iterates recursively, but the order of the visited files/dirs is unspecified, each directory entry is visited only once. In both iterators the directories . and .. are skipped. The above example uses not a recursive iterator but does the recursion on its own. This is because I’d like to present the files in a nice, tree style order. The code iterates over entries, each entry contains a path object plus some additional data used during the iteration. Create files, move, copy, etc. Today I wanted to give you a general glimpse over the library. As you can see there are more potential topics for the future. Chapter 7, “Working with Files and Streams” - of Modern C++ Programming Cookbook. examples like: Working with filesystem paths, Creating, copying, and deleting files and directories, Removing content from a file, Checking the properties of an existing file or directory, searching. I think the filesystem library is an excellent part of the C++ Standard Library. A lot of time I had to use various API to do the same tasks on different platforms. Now, I’ll be able to just use one API that will work for probably 99.9% cases. The feature is based on Boost, so not only a lot of developers are familiar with the code/concepts, but also it’s proven to work in many existing projects.